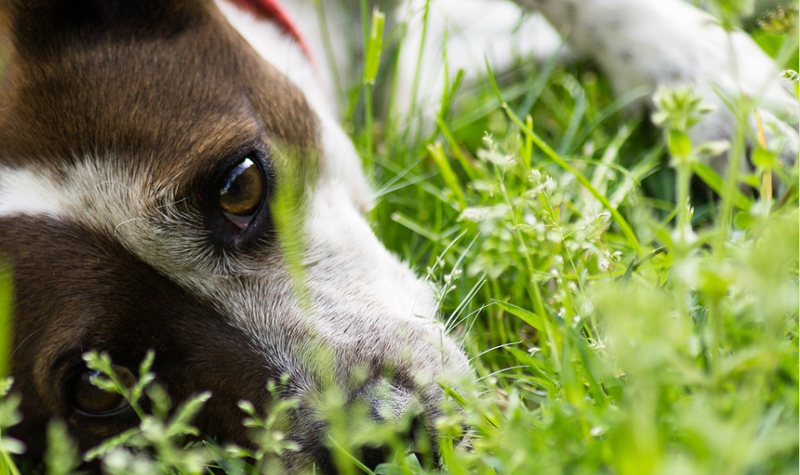 What Are Probiotics And How Do They Help My Dog? 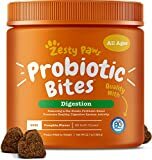 Where to buy probiotics for dogs? 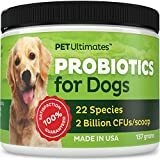 When to use probiotics for dogs? Do probiotics for dogs work? Which probiotics are safe for dogs? Are human grade probiotics safe for dogs? Before you go out and purchase the very first probiotic supplement you come across, you really ought to read up on them a bit, and also see which ones of them are considered the best. Choosing the best one all by yourself could be a bit tricky, and that is why we have decided to give you a list of the top 5 premium probiotic supplements for your dog. See which products they are, figure out which of them is the best for you, and if you’re still not sure, we’ll recommend our top pick at the end of the article. For other ways of helping your pet, try CBD oil for dogs. 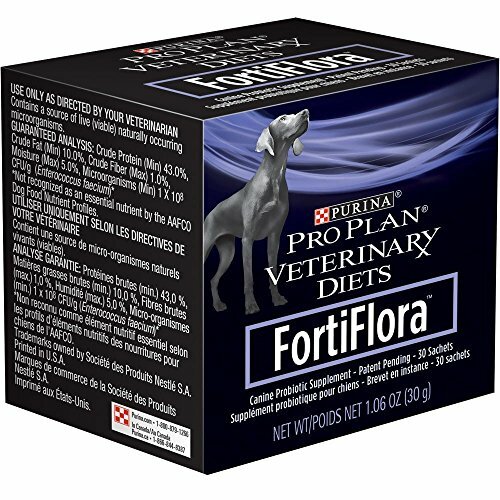 Purina Veterinary Diets Fortiflora is one of the most popular probiotic supplements on the market and is our favorite supplement for dogs. 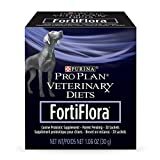 The proof that this supplement is extremely popular is the fact that many licensed vets recommend it to the owners of their dog-patients because it has been proven to help out with various gastrointestinal issues, such as the digestive health, managing problems with diarrhea, lessening them, etc. Now, diarrhea usually occurs in dogs because of a sudden change in the dogs’ diet, stress in their surroundings, or antibiotic therapy. Luckily, this product can help in all of these situations, so if you have a dog that’s been suffering from digestive tract problems or other digestion issues, this is the digestive health product for your dog. Even though there is no need for a vet’s prescription in order to get this probiotic product, it is highly recommended that you visit a veterinarian before you decide to purchase it. Only when the vet recommends it should you get it for your dog, and it will help them to overcome their problems. This probiotic has extremely good rates which have been granted to it by the people that have purchased it. They claim that this product offers amazing results, and even though there are numerous other supplement products for pets on the market, this one seems to be the top at what it does. Why We Like It – This is our favorite product off this list, and is recommended by many veterinarians for dogs that have problems with digestive health and diarrhea. It is a probiotic supplement that is considered by many to be the right one. This is another amazing premium probiotics for dogs, and you know the product is great when it comes from such a trustworthy company. Vetri Mega probiotic is a supplement made up of more than 5 billion various microorganisms, as well as 8 different digestive enzyme strains. The greatest thing about them is the fact that all of them are non-diary sourced. Besides the microorganisms, there are also probiotics in this product, such as the fructooligosaccharides, which are basically fibers that are fully soluble. They promote the growth of many microbes in the intestines of your dogs which is a positive thing because they are extremely healthy. It is exactly these Vetriscience Vetri mega probiotics for your dog that turn this product into an amazing one and unique. It is both powerful and non-harming, which means that it is just perfect for your dog. 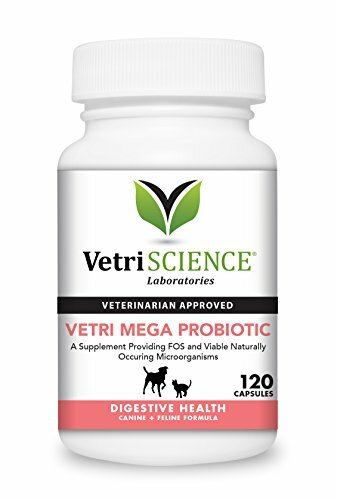 This Vetriscience Vetri mega probiotic supplement is a probiotic product that is rather easy to administer to your dog, which is not really a quality of a lot of these products. You will no longer have to worry about having any problems with your dog not wanting to take this supplement, and you’ll easily make your dog take them every single day. You just have to pour the capsules all over your dog’s food in order to release the probiotic powder there, and the dog will never even know the difference. So, the Vetriscience Vetri mega probiotic will help the dog and offer amazing health benefits, and won’t even know that he is being administered a cure – that’s just an amazing thing. Why We Like It – This great probiotic powder supplement for dogs comes from a well-respected company and contains 5 billion various microorganisms within each of the capsules, as well as 8 different strains, each strain of bacteria important – and they, are all non-dairy sourced. Fantastic for your dog’s health! This is a great probiotic supplement, or as the name of it would say, it is an amazing one. It is a probiotic product that offers various and numerous health benefits to your dog, combining all of that with a great taste that the pets seem to like very much. There can be a lot of dog supplements that taste bad and that the pets won’t even come near, this one is not one of them, because your furry friend will eat it with great pleasure. 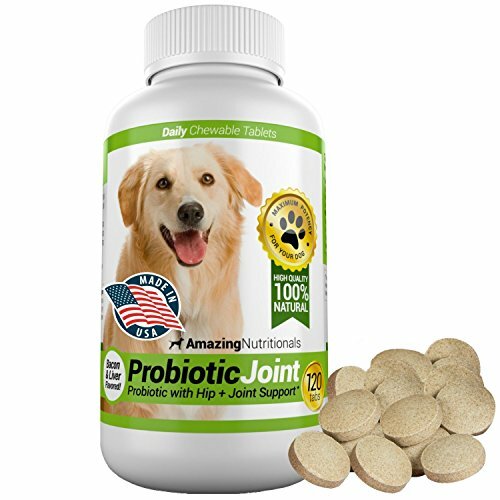 Amazing Nutritionals Probiotic Joint is a brand that has no byproducts or allergies, which basically means that it is a product that is completely safe and healthy for all types and breeds of dogs. This probiotic supplement does more than just helping your dog to be healthy; it can also help your dog become good looking because it can improve the dogs’ skin and coat. Apart from that, this product is also amazing in improving the condition of the joints, relieving joint pain, and the digestive health of the dog. Also, this product is known to be able to eliminate the bad breath, the loosened bowel movement, stomach bloats, yeast infections, etc. You don’t have to worry about doing anything wrong with this product because it comes with instructions which are really easy to follow. You just have to decide how many pills you ought to give to your dog, and you can do that by figuring out how much he weighs and hopefully this should be a healthy weight. Bigger animals get more chewable tablets, and the smaller ones get less. This product is completely free of any corn, yeast, grains, wheat, shrimp, fish oil, or any other ingredient that could be considered harmful for your dog. This is an amazing probiotic supplement, and you should definitely keep it in mind. Why We Like It – There are no byproducts in this supplement for pets, nor are there any allergies, making it perfectly safe. 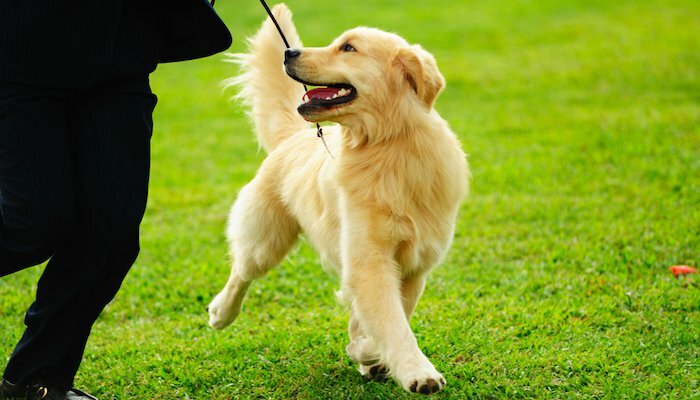 It can improve the K9s coat, skin, as well as their digestive health. It is also able to eliminate bad breath, improve loosened bowels, prevent yeast infections, and help with the stomach bloating. 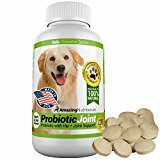 This probiotic supplement from dogs comes from a brand that is widely considered to be trustworthy in the field of pet supplements as well as pet food. This is a product that contains a vast amount of probiotics that can help with the digestive problems that your dog might be experiencing, as well as other problems that could be tormenting your dog. Also, Nusentias Miraclezyme is a brand that can help prevent food poisoning, and also help them look nicer by increasing the health of their skin and coat. The ingredients found in these Nusentia miracle probiotics for your dog are 100% natural and are therefore a great choice for all breeds, sizes or types. If you wish to prevent the growth of the harmful gut bacteria that can be found in your dog’s organism, that you ought to get this item because it is great at eliminating this threat! Now, because this brand is extremely reliable, and because the bottle of it offers huge benefits, this supplement is considered to be great by many. 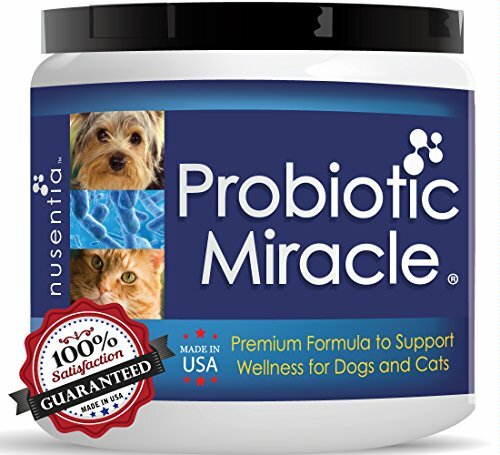 Each container of Nusentia probiotic miracle dog probiotics offers you 360 doses, and each of them contains about 5 billion beneficial probiotics. Also, another thing that makes this probiotic product great is the fact that if you’re not fully satisfied with it, you can get your money back! Why We Like It – This Nusentia probiotic miracle product offers various probiotics which help out with digestion issues and other health issues. This supplement is great at preventing food poisoning and help with the skin and coats healthy. The ingredients are natural, making this product amazing. 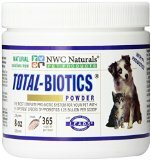 NWC Natural Total-Biotics for Dogs and Cats is the last product on our list and is also a great one for preserving the great health and looks of your pet. This is a brand that comes to use with a new and improved probiotics formula that contains 14 different types of stabilized probiotics that can be used to help both your dogs and cats. Many vats gladly recommend this product to their patients’ owners, and especially to the pet parents who wish to make sure to have a pet that’s going to live a long and healthy life. Another thing that tells us that this brand is great is the fact that it has been on the list of top-sellers for the past 6 years! The NWC Natural Total-Biotics is the most popular product for improving the health of dogs in the United States, and is even approved by the vegetarians! Not many products include stabilized glutamine, but this is exactly the thing what has made this product so great. This is a highly recommended supplement because it pretty much has everything a supplement for dogs needs to offer. 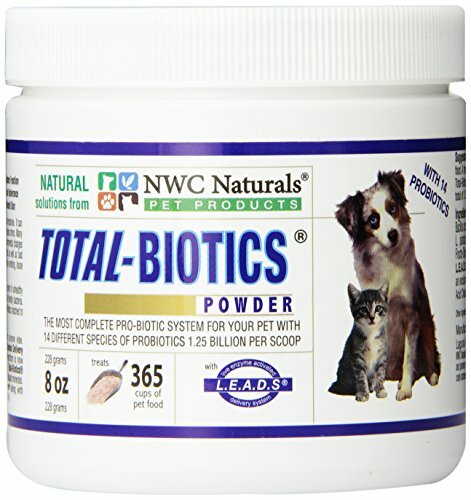 Why We Like It – These NWC Natural Total-Biotics probiotic supplement offers many health benefits to your pet, and that is mostly due to the new and improved probiotics formula with 14 stabilized probiotics that are the ingredients of it and that are healthy for them. Many veterinarians recommend this product. It is really important for a dog to have a healthy digestive tracts, and in that sense, the probiotics can offers huge help. In case you are not that sure of what exactly the probiotics are or how they can be used in order to help your dog, then you’re in the right place because we are going to show it all to you in this article. Basically, probiotics are live bacteria and yeasts that can be used to promote good health, and especially the health of the dogs’ immune system. Even though when we think of bacteria, we immediately think of something completely harmful and something that is the source of all the possible illnesses, the truth is that the probiotics are something good – something that offers us healthy gut bacteria which both humans and dogs need in their bodies in order to be healthy. That is why these kinds of supplements are great for both humans and pets that have been suffering from various gastrointestinal issues, and what’s even better about them is the fact that they can even prevent future health problems of this kind. So, if you are a dog owner who wants to make sure that their dog lives a full, healthy and happy life than the probiotic supplements can be hugely beneficial. These benefits include preventing diarrhea and lowering the levels of cholesterol. In order to have healthy and normal functioning of your dogs’ immune system, you need to feed your dog with these natural gut bacteria that you can find in this supplement. They will offer a lot in the sense that they’ll get everything your dog’s body needs on a daily basis. There are numerous benefits of probiotics for your dogs’ health, and therefore it is really important to find out as much as you can about them, and especially if you have a dog that has been experiencing gastrointestinal problems. By regularly giving your dog this supplement, you would be able to restore all the healthy, beneficial bacteria (living bacteria) in the digestive immune system that your dog’s body needs, and this can help fix a lot of issues that your pet’s been experiencing. Dogs digestive systems are something that can be extremely delicate as they have quite sensitive stomachs, and that is the main reason why so many dogs experience various types of gastrointestinal issues, and what’s really important to keep in mind is the fact that some of these can be rather serious. Probiotics can do much in helping to support and maintain a healthy working digestive immune system, and this is something that all the experts agree on. Also, what’s great about probiotics is the fact that they have powerful antioxidant as well as anti-inflammatory properties, which are benefits that can contribute a lot to the well being and health of your dog. Another thing worth considering is the fact that giving these probiotics to your dog can help increase the dog’s resistance to pet food poisoning, which is definitely an important thing. Due to the fact that K9s are creatures that like eating everything that comes in their path, including the stuff that can be toxic to them, such as chocolate, it is really important to have something that is going to enhance their resistance to food poisoning. 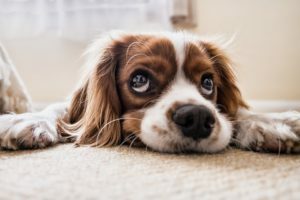 Of course, this doesn’t mean that your dog is going to experience a complete loss of functions of the gastrointestinal system if he takes one small bite of chocolate, but if he were to eat a lot of it, it could be deadly for him! However, if you start giving probiotic supplements to your dog on a daily basis, their lives could be extended, and their overall health improved. 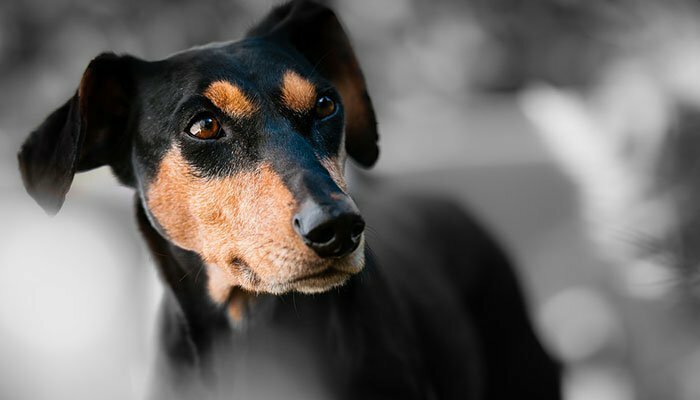 The reasons why a dog would need probiotics are numerous, and therefore, it is really important to know how to recognize the signs of that need. If you have a dog that vomits or gets diarrhea, excessive gas on a regular basis or on a semi-regular basis then it might be time to start considering giving probiotics to your dog. Probiotics can be a huge help in enhancing your dog’s digestive/gastrointestinal health in a sense that there will no longer be any occurrence of the previously describes problems. It is true that the probiotics work differently for different breeds, but they have been proven to work for the vast majority of breeds. 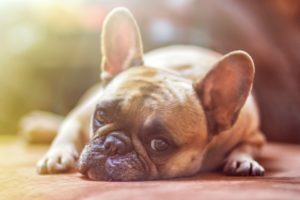 By giving probiotics to your furry friend, you can eliminate these kinds of problems happening to your pet in the future, and you will no longer have to worry about their health and well being. If you were reading this article and started thinking that you really ought to start giving probiotics to your dog, you should really read a bit more on them and especially about the possible side effects that the probiotics might cause. 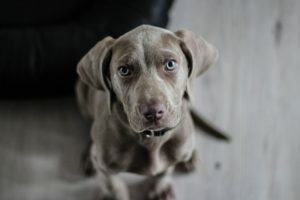 There are some side effects, that is true, just like there are side effects for any medical brand out there, but the difference with this brand is the fact that the side effects that it offers are extremely mild and only affect the digestive system of your dog, which could result in gases or bloating. Most of the serious side effects that happen due to the use of probiotics actually happen in people, but they have been known to occur in some pets as well, more specifically, in dogs and cats. 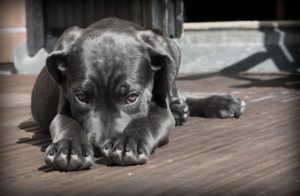 Theoretically, it is believed that these dog supplements might cause some infections in your pets that can later be treated with antibiotics, but it would appear that these kinds of side effects happen rarely, if ever! It is believed that the probiotics might cause some mild metabolism problems or the overstimulation of the immune system of your pet. Therefore, the greatest course of action would be consulting a veterinarian before you start administering probiotics to your dog. 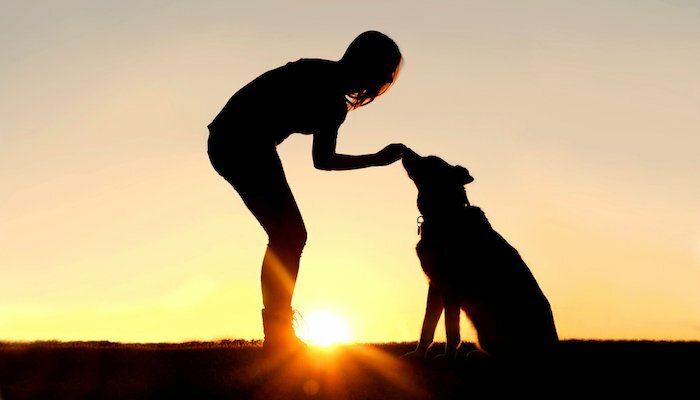 Even though it is true that the probiotics can offer huge benefits to your pet’s health and well being, it is also true that it is possible that your pet could experience some of the side effects, and that is why it would be wisest to consult a professional before you do anything. Even though the side effects are rather mild, it is always better not to risk it. Also, the dog owners ought to keep in mind that there is a possibility of the occurrence of some side effects, with the serious ones being extremely rare and the health benefits significantly outweighing the possible side effects. Most dog owners know that the probiotics are something that can be extremely beneficial to your pet, and that is why some of them ask this question. The answer is that you can buy them in all the places you’d usually buy pet food – at the pet store or online. There are numerous websites out there that offer these supplements, and that is why it is really important to check them out first, before actually purchasing anything from them. The greatest choice would be the Amazon because they have the lowest current prices and the largest selection of probiotic supplements online. If you have a dog that has been having noticeable digestive problems, like constipation or diarrhea, then you might start considering giving probiotic supplements to them, because they could help with that issue. So, if you have a dog with serious gastrointestinal issues, make sure you seriously consider these probiotic supplements as soon as possible, because they can help minimize the symptoms, and more importantly, increase the level of comfort of your pet. There have been countless studies done on these issues, and the results that they have offered look really promising. The basic outcome of these studies seems to indicate that these probiotics have the potential to help the dogs that have been suffering from various gastrointestinal problems, like constipation or diarrhea. Another important benefit that these dog supplements can offer is the boost of the immune system in dogs, which is being done by correcting the imbalance of gut bacteria in the organism. This can increase the overall health of the dogs, as well as well-being. Even though there are numerous human foods that contain the very same microorganisms that you can find in these probiotic supplements, most vets would agree that it would be better to give the dogs the actual supplements, and not the human food. Pretty much all of the probiotic supplements that you can find in the trusted pet stores or online stores are safe to give to your dog. There really isn’t any big difference between the probiotics that were meant for human use and the probiotics meant for dog use. However, there are some companies that make supplements with different ingredients for humans and different ones for your pet as well. Even though there is a possibility that the ingredients of these two types of probiotic supplements may differ, there is nothing wrong with giving your dog human grade probiotics supplement, as long as your dog can swallow them. 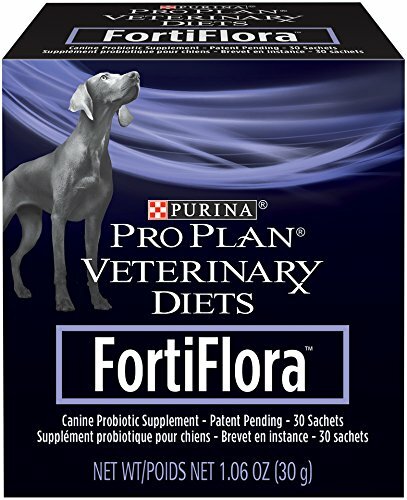 Of all the amazing brands presented here, we believe that the greatest one is the Purina Veterinary Diets Fortiflora. 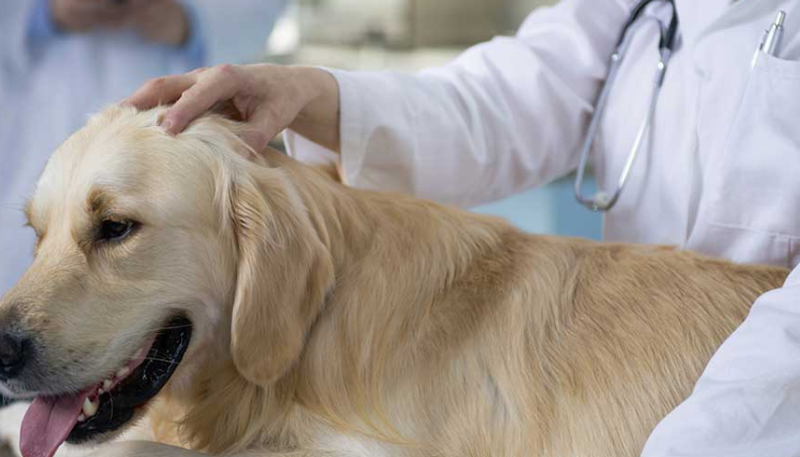 It is a brand that is highly recommended by both the veterinarians and the professionals. The ratings of this product are extremely high, meaning that the customers love it as well and that they are happy with its results. If you have a dog with digestive problems, than this is the product for you!